A death masque was taken on April 26, 1934 of LeBaron Russell Briggs (1855-1934) by the sculptor Frederick Warren Allen. “He was an important man!” remembers Barbara, the eldest Allen daughter. A big committee had been formed at Harvard College to choose an artist to create a likeness of their beloved Dean, and representatives of the committee were coming to their home in Concord to talk with their father! The five children were instructed to go upstairs and wait quietly until the guests had left. It was a very exciting event, so the children all listened at the top of the stairs for the news. This was an important commission, not only because of the man to be memorialized, but also because during the Great Depression, artists had trouble earning a living. This would help their circumstances greatly. So there was great celebration when the children were told the news that their father had been selected to do a large marble portrait bust. A great honor! Briggs was a Professor, the first Dean of Students at Harvard College, Dean of the Faculty, and President of Radcliffe College. A liberty ship and a hall at Harvard were both named after him. His importance as Dean was that his position was the first where a person had been appointed to advise students and faculty on both academic and personal affairs. He first served as Dean of Men and then as Dean of the Faculty of Arts and Sciences. It was the beginning of what is now called Student Affairs. “Admired by generations of students for his kindness and benevolent guidance, LBRB had a profound influence on his students. They placed him among the very great teachers of English and the classics,” reports the Radcliffe College Archives. The magnificent 23 inch high marble portrait bust of LeBaron Russell Briggs is part of the Fogg Museum‘s grand Portrait Collection in University Hall at Harvard University, one of 15 marble busts around the perimeter of the room above which rows of grand portraits painted of great Harvard men hang in a salon-style display. 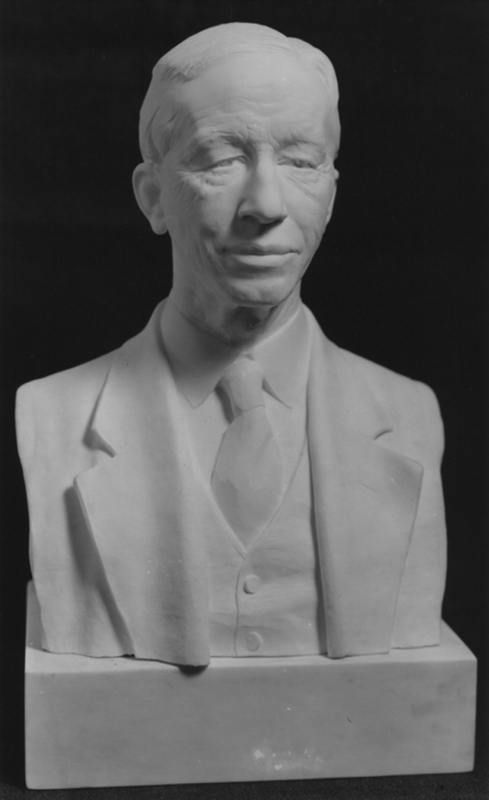 Radcliffe College ordered a copy of the marble portrait cast in bronze in 1937. Brigg’s importance to women is that, under his watch, Radcliffe College grew into a respected educational institution with a degree for women equivalent to a degree from Harvard and won admission for women into the PhD program in medical science at Harvard Medical School. There would be a few things to note about the bust if you were to visit Faculty Hall. What is distinctive about the portrait is the realism. Faithful to the tenets of the great Boston School artists, Allen has represented this man with truth, beauty and consummate skill. He has not idealized the art. He has included the moles and wrinkles, the bumps and furrows, the uneven eyes and the imperfections in the face along with the serene and kindly expression that characterized the man. One can feel dignity, humanity and warmth. The bust is hand-carved in marble, indicating the value not only of the piece of sculpture, but also of the stature of the man and the importance of the bust. As in the classical style, the herm bust format is used, cutting the figure straight down the sides of the shoulders and the back to a squared supporting plinth which conforms to the pedestal that lifts it to the height of the other busts. This is a subtly modern gesture while remaining classical, late Greek Republican, geometric forms being more modern in the new view of art in the 30s and the “veristic” style which, while antique, is very early nineteen-hundreds Boston. A realistic nuance is the undercut of his right side lapel in front at a level that shows the top two buttons of his vest and the little cowlick on the left side of his head. And so it stands with dignity in the great hall at Harvard, a fitting tribute to a great educator, a wise advisor and a beloved man.